A great deal of combat robot design is trial, error, and study of successful competitors. However, there are some elements of design that can be fairly well quantified -- at least well enough for a 'reality check' on your ideas. Presented here are descriptions, explanations, and links to combat robot design tools developed or adapted by Team Run Amok. History - The original Team Tentacle Torque/Amp Calculator was written by Steve Judd of Tentacle Combat Robotics. A highly respected combat robot builder and a selfless supporter of the sport, Steve died in 2010 after a long fight with repiratory disease. His loss was deeply felt in the community. 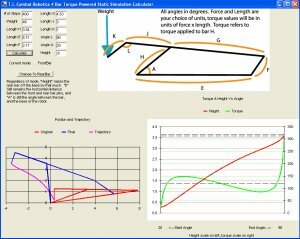 This Version - Following Steve Judd's death, Team Run Amok began a series of updates to the calculator that include support for new motors, expanded help files, and revised formating. Steve's core program is unchanged, and a link back to the original version appears in the upper right corner of the 'Reloaded' calculator. The pull-down motor selections have been expanded with popular new motors and updated motor performance figures. The listings of all possible combinations of 'can' motors and their matching BaneBots gearbox options have been replaced with a popup window that displays the BaneBots P60 and P80 gearbox ratios. Select your BaneBots motor and fill in the gear ratio from the list. The 'battery chooser' now includes listings from the extensive 'SPARC Tools' LiPoly data file. 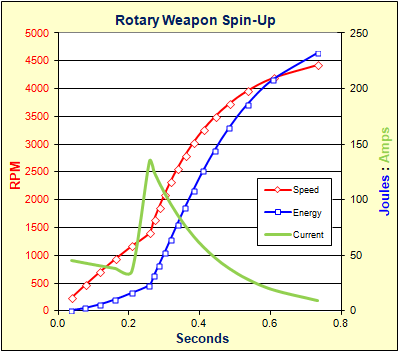 This Excel spreadsheet fully models and graphs the performance of rotary weapons made up of rings (tubes), disks, and rectangular bars sharing a common center of rotation. You may combine elements to make up your weapon such as a ring and a disk to make a 'tuna can' spinner, or you may input a known moment of inertia for CAD cut-out disks or asymmetric weapons. The model accepts any material with a known density, any brushed or brushless PMDC motor with known performance parameters, and any gear reduction ratio. Calculates weapon mass, moment of inertia, stored kinetic energy, tip speed, spin-up time, and approximate battery capacity requirement. Includes conversion calculations for english/metric units, and a table of common material densities. A sample output chart is shown at right. Update - Version 19.c released on December 20th, 2017 had a reported problem with the battery calculation function. Version 19d uploaded December 21st, 2017 corrects that problem and defaults to brushless drive motor calculation. Requires Microsoft Excel. Download and open as a standard .xls speadsheet. Prefer an on-line spinner calculator? This lite version of the full spreadsheet runs in your browser window and calculates weapon mass, moment of inertia, stored kinetic energy, and spin-up time. Suitable for use with smart phones and tablets as well as laptop/desktop computers. An overhead hammer weapon powered by an electric motor is really just a spinner weapon with very limited rotation. With that in mind I modified the Spinner Weapon Spreadsheet to model a hammer swinging thru 180 degrees. I originally wrote this for my own use to talk a builder out of building an electric hammer weapon, but with the increased interest hammer weapons in the 'sportsman' I thought there might be some general interest in this tool. 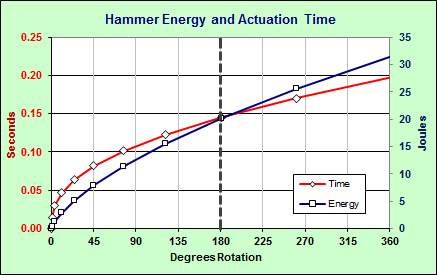 The current Version 1.2 is designed to model hammers starting from horizontal and swinging up and over thru 180 degrees. Calculations account for gravity but do not include the inertial moment of the motor armature. Graphic output shows time and energy storage thru 360 degrees of rotation, with a text box commenting on the suitability of the selected motor gearing in achieving best actuation speed and maximum energy storage at impact. Tired of the same old flipper designs? Having trouble finding insect-sized pneumatic components? Spring powered flippers are awesome, but the rewind and fireing mechanisms are poorly known. The elegant and stable 'Servo Latch' reset. Step-by-step instruction on selecting an optimum gear reduction and wheel diameter combination for a combat robot of a given weight powered by specific Permanent Magnet Direct Current (PMDC) motors. Although these instructions may be used alone, this document is intended as a companion to the Team Tentacle Torque/Amp Calculator discussed above. It provides an explanation of theory and equations used by that applet and offers guidance on adjustments required for arena size and unusual conditions. Frequently Asked Questions about spinning weapon design from the 'Ask Aaron' website. This FAQ provides theory and design advice on energy storage, rotational speed, motor selection, and spin-up time. Additional discussion on spinning weapons is available in the Ask Aaron Combat Robot Weapons archive. This a useful companion document to the 'Team Run Amok Spinner Weapon Excel Spreadsheet' mentioned above. This page has links to several topic-specific guides authored by Team Run Amok to assist combat robot builders in selecting, setting up, enhancing, and troubleshooting radio control systems. Topics include techniques to cure radio reception problems, explanation of radio features useful to combat robot operation, deffinition of R/C terminology, and use of solid-state gyroscopes to improve robot driveability. Combat Guide: FlySky FS-i6 Transmitter. Squeeze the best performance from your 'bot with Team Run Amok's new programming guide for the most popular transmitter in combat robotics! The T.i Simulator will calculate and graphically display the range of motion and torque requirements for either front-bar or rear-bar torque-powered 4-bar lifter designs. The simulator requires Microsoft '.NET Framework 1.1' to operate. The .NET software is a free download, but version 1.1 is not supported by Windows 7 and later Windows operating systems. I'm working to correct his problem but for now you must install the simulator on a pre-Windows 7 computer. After a little thought I realized that there was another tool that should be salvaged from the wreckage of the T.i. Combat Robotics site. Their 'Designing Around the Gyroscopic Effect' page has a full explanation of the forces at play when a vertical spinning weapon exerts a lifting force on a turning robot. That page is now safe here at RunAmok.tech. Want to try your hand at a pneumatic flipper? The builders of Robot Wars competitor 'Hassocks Hog' put together this Excel spreadsheet to model the performance of a wide range of designs. Review the basics of pneumatic system design at the Team Da Vinci: Understanding Pneumatics page and ponder a few more advanced techniques at the Team Run Amok: Pneumatics Tricks and Tips page , then try out a few designs on the flipper spreadsheet. The Hassocks Hog website remains operational as of mid-2017, but you may want to download my 'printer friendly' PDF version of the flipper calculator page to have a set of instructions to follow when using the spreadsheet.